ENERGY STAR Program Managers from the U.S. Environmental Protection Agency (EPA) and additional team members attended this year's National Restaurant Association (NRA) Show 2013 from May 18-21, 2013 in Chicago, IL. If you did not have the opportunity to speak with a representative in attendance or have additional questions, please contact commercialfoodservice@energystar.gov to schedule a discussion. ENERGY STAR Commercial Food Service (CFS) equipment manufacturing partners demonstrated leadership and expertise in designing energy-efficient products that meet industry demands. EPA would like to extend congratulations to the following ENERGY STAR partners that were recognized as 2013 Kitchen Innovation Award Winners at the NRA Show: Alto-Shaam, Duke Manufacturing, Ecolab, Follet Corporation, Garland Group, Hobart, Manitowoc, Master-Bilt, and Meiko. For more information, visit http://show.restaurant.org/Attend/Attractions/Kitchen-Innovations-Award. According to FastCasual.com, operators are realizing that there is a return on investment (ROI) when investing in energy efficiency. In fact, an article here about the NRA Show states, "The underlying theme throughout the National Restaurant Association Show floor as it related to equipment trends was 'energy efficiency.' This wasn't so much the case in past years." -	One session titled "Moving Forward with Sustainability: food waste, packaging, and energy/water-efficiency" featured Richard Young, Sr. Engineer and Director of Education at Pacific Gas & Electric's (PG&E's) Food Service Technology Center (FSTC) and panelists from LeanPath and Chipotle Mexican Grill. At this session, Richard Young called cooking equipment the most energy-intensive part of a restaurant and advised operators to be sure any replacement has earned the ENERGY STAR. Hobart also recognized their 2013 grant recipient, Duluth Grill, in this session. See the article below for more information. -	Another session titled "7 Ingredients to Creating Food Service Operations that Support a Sustainable Menu" featured David Zabrowski, Director of Engineering at FSTC and focused on best practices to minimize waste and electricity costs. When asked what operators should do to increase the sustainability of their operations, Zabrowski suggested purchasing ENERGY STAR certified equipment. Speakers included Joe Carbonara, Editor of Foodservice Equipment & Supplies (FE&S) magazine; the Director of Building Systems Design for Hyatt; a panelist from Candacity LLC (a food service management company); and an independent food service consultant and chef. 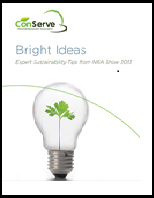 NRA's Conserve program highlights these and other education highlights in the new report, Bright Ideas: Sustainability Tips From Restaurant Industry Experts, available on the Conserve website. The NRA Show educational sessions were recorded and are now available on the NRA Show website here or by clicking "Attend: Education" at http://show.restaurant.org/Home. EPA also hosted a stakeholder meeting during the Show to discuss the ENERGY STAR commercial refrigerator and freezer specification revision effort. To download meeting slides and a copy of the current specification draft, see the Product Development Updates article below. EPA is currently working with industry stakeholders on revisions to the ENERGY STAR Commercial Refrigerators and Freezers specification. Detailed updates are provided below, and more information can be found on the ENERGY STAR Product Development webpages accessed at www.energystar.gov/revisedspecs. During the 2013 NRA Show, EPA hosted an ENERGY STAR stakeholder meeting on Monday, May 20, 2013 to discuss the Draft 1 Version 3.0 Commercial Refrigerators and Freezers specification that is in development. Under the revised specification, EPA will harmonize with U.S. Department of Energy (DOE) standards for commercial refrigeration equipment. EPA will release the Draft 2 Version 3.0 Commercial Refrigerators and Freezers specification in mid to late July 2013 and has proposed an effective date in September 2014. EPA expects to release the Final Draft specification by October 2013. On April 1, 2013, EPA published the Final Version 2.0 Commercial Ovens specification. Combination ovens are now eligible for certification, and the list of EPA-recognized laboratories for testing of combinations is available at www.energystar.gov/3rdpartycert. The revised performance requirements for convection ovens, including third-party certification requirements, take effect on January 1, 2014. On June 26, 2013, EPA released a proposal to amend the commercial griddle specification. The amended specification, Version 1.2, removes the cooking-energy efficiency requirement on an interim basis while retaining the normalized idle energy rate requirement as the basis for ENERGY STAR certification. Visit the commercial griddles partner page here for the Version 1.2 Commercial Griddles specification and explanatory memo. Stakeholder questions can be directed to Christopher Kent, EPA, at (202) 343-9046 and kent.christopher@epa.gov, or Adam Spitz, ICF International, at (202) 862-1226 and adam.spitz@icfi.com. Hot food holding cabinets (HFHCs) can be found in most food service establishments, from quick service and casual dining restaurants to academic institutions and hospitals. Like much commercial kitchen equipment, these cabinets can weigh heavily on your utility bills if they are not designed to use energy efficiently. Commercial HFHCs that have earned the ENERGY STAR are approximately 70 percent more energy efficient than standard models. This equates to utility bill savings of approximately $300 per year and more than $2,800 over the lifetime of the product. In addition, utilities across the country offer prescriptive incentives (rebates) ranging from $110 to $900 to help offset initial purchase costs. Check out the CFS Incentive Guide to learn more. If all HFHCs sold in the U.S. were ENERGY STAR certified, the CFS industry could help prevent greenhouse gas emissions equivalent to the emissions from more than 160,000 vehicles. For HFHCs to meet the ENERGY STAR performance levels, manufacturers use innovative design approaches such as more precise controls, full-perimeter door gaskets, magnetic door handles, additional insulation, and/or Dutch doors. The improved technologies used in ENERGY STAR HFHCs yield additional benefits including, but not limited to: better temperature uniformity, cooler external cabinet temperatures leading to reduced impact on HVAC equipment, and extended product lifetime. EPA first launched the ENERGY STAR HFHC specification in 2003. The current ENERGY STAR HFHC Version 2.0 specification went into effect October 2011 and covers glass and solid door cabinets with fully enclosed compartments and one or more doors. The current list of certified models can be viewed at www.energystar.gov/cfs. For a list of partners, visit the HFHC Partner List. Restaurant operators and commercial kitchens can also be recognized for integrating ENERGY STAR certified equipment, including HFHCs, into their operations. For more information, visit www.energystar.gov/cfs/success. Did you know that the ENERGY STAR program covers more than products? Certain types of buildings can earn the ENERGY STAR too, and soon food service establishments may be able to qualify as well! The NRA and the Restaurant Facilities Management Association (RFMA) are working in partnership with EPA, DOE's Better Buildings Alliance, and PG&E's FSTC to develop an energy use survey for restaurants and commercial kitchens. Examples of facilities that can partake in the survey include full-service restaurants; limited-service restaurants; coffee or beverage shops; educational, military, corporate, or hospital cafeterias; and many other formats. The survey will be released this summer and the data collected through this survey will be used to inform the development of an ENERGY STAR 1-100 score for food service facilities. This score can help kitchen operators track their energy improvements over time or compare themselves against peers nationwide. Buildings scoring above 75 may be able to earn the ENERGY STAR. Input and participation is needed to successfully develop this score for food service establishments, so be sure to complete the survey once it is released. For more information, please send an email to FSEWSurvey@rfmaonline.com. Gerharz Equipment, Inc., an ENERGY STAR CFS equipment dealer and retail partner based in Syracuse, NY, is a family-owned and operated business that has been in service for over 40 years. Gerharz became an ENERGY STAR partner in 2011 and is committed to raising awareness of energy efficiency and ENERGY STAR certified equipment options that meet client demands. Gerharz is also a member of the PRIDE Marketing & Procurement buying group, an ENERGY STAR buying group partner that has a training effort focused on educating dealers on ENERGY STAR and energy efficiency. Gerharz offers a large inventory of commercial kitchen equipment in their 15,000-square-foot showroom. The company actively displays the ENERGY STAR partnership mark on its website and is featured on the ENERGY STAR "Where to Buy" list. Gerharz has also co-branded several of the ENERGY STAR product sell sheets, including commercial griddles, refrigerators and freezers, and fryers. These materials have allowed the company to easily show customers estimated lifetime and annual savings in dollars and energy usage; the wide range of utility rebates available, approaches manufacturers are using to reduce energy consumption in the products, and some additional benefits of ENERGY STAR certified equipment for end users. The Gerharz sales team makes it a priority to stay knowledgeable about cutting edge products on the market and help customers identify products that meet their performance and reliability needs which can also help them save money. Qualified equipment on their showroom floor is clearly marked as ENERGY STAR and the applicable rebate amount is prominently displayed. In addition to using the ENERGY STAR website, Gerharz team members review www.fishnick.com with customers to help them understand the efficiency of specific equipment they may purchase. Gerharz also engages with their local utility provider to get rebates for their customers purchasing energy efficient gas equipment. "It is an education process," says Scott Gerharz, President and second generation leader of Gerharz Equipment. "We educate our sales team and they in turn educate our customers so they can make informed decisions about the equipment to buy." The Gerharz website has links to the ENERGY STAR website and other resources with information on energy efficient restaurant equipment. To learn more about Gerharz Equipment, visit www.gerharzequipment.com/AboutUs.aspx. EPA welcomes the opportunity to work with dealers, distributors, and sales representatives. If you are interested in scheduling a seminar to learn more about ENERGY STAR and the benefits of certified equipment, please contact commercialfoodservice@energystar.gov. In May, Hobart awarded a $5,000 grant to the Duluth Grill, an independent family-owned business in Duluth, MN. Duluth Grill was awarded the 2013 Hobart Center for Foodservice Sustainability (HCFS) grant in recognition of the restaurant's sustainability initiatives, which include reducing energy and water use, reducing wastewater and solid waste, and implementing Farm-to-Fork programs. 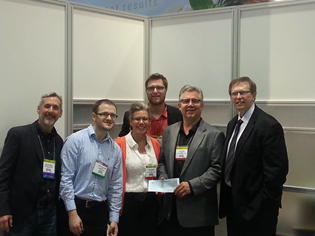 Members of ITW Food Equipment Group recognize Tom Hanson, Owner of Duluth Grill - ITW's 2013 HCFS Grant recipient. While Duluth Grill has consistently grown revenue over the past few years, the company has simultaneously reduced utility costs by 51.6 percent after replacing older equipment with ENERGY STAR certified models. The restaurant has also implemented other energy-saving measures such as replacing incandescent bulbs with LED bulbs, recycling, composting, and mitigating storm-water runoff. In addition to saving energy, the company sources 32 percent of its food from local suppliers and runs an urban farming operation. According to Tom Hanson, Owner, "The Duluth Grill is honored to receive this award, which acknowledges the extensive sustainability steps we've taken to put our business ahead of the curve locally. We are part of a trend that has national and international appeal, and that will be an unavoidable fact for a viable economic future." This marks the sixth year for the HCFS grant, which is awarded each year to a business or organization judged to have the best-executed food service sustainability project(s). More information about the HCFS grant is available at www.hcfsforum.com. EPA recognizes that the verification testing of the eight CFS equipment categories—dishwashers, fryers, griddles, HFHCs ice makers, ovens, refrigerators and freezers, and steam cookers— presents some challenges unique to this industry. EPA also recognizes that the CFS products are different than other categories in terms of overall sales/size of industry and the structure of the market. Recognizing the value of greater certainty, EPA has elected to supplement the existing annual verification testing requirement for CFS products with a limitation on the number of models eligible for testing on a per-manufacturer basis. Specifically, EPA is limiting the amount of testing for a particular CFS manufacturer to no more than 10 percent of "unique" qualified models per product category per verification testing cycle (12 months). For purposes of determining the 10% maximum per manufacturer, certification bodies (CBs) would take the same approach used for determining the overall 10% of "unique" models per product category as described in Directive 2011-06: "ENERGY STAR Verification Testing Supplement: Selecting Products, Obtaining Products, and Reporting Results" where privately labeled model(s) and the associated original equipment manufacturer (OEM) model should count as one unique model. EPA plans to continue to review the results of verification testing over the next year to determine if further modifications to verification testing of ENERGY STAR CFS products are warranted. For questions regarding this alternative solution for CFS or about general verification testing policies, please contact Certification@energystar.gov. The EPA's WaterSense® program created WaterSense at Work: Best Management Practices for Commercial and Institutional Facilities to help managers and owners of restaurants, office buildings, hotels, schools, hospitals, and other building types identify and take advantage of water saving opportunities. In restaurants, water use in the kitchen can account for nearly 50 percent of the facility's total water use. Several other commercial and institutional sectors, including hospitals, offices, schools, and hotels, also have substantial kitchen water use that accounts for as much as 10 to 15 percent of the facility's total water use. The type and water use of commercial kitchen equipment will vary depending upon the scope and scale of the kitchen's operations. In most commercial kitchens, the commercial dishwasher and pre-rinse spray valve account for over two-thirds of the water use. EPA is in the process of finalizing the WaterSense specification for Pre-Rinse Spray Valves. For more information on the specification development effort, visit www.epa.gov/watersense/partners/prsvs.html. Food Service Newsletter in October!